As of this post, all art sent! Thanks for a super fun stream to start the week off right. We had a couple giveaways, drew a bunch of pictures and had a lot of laughs. I didn't stream this afternoon while doing other work too boring to stream, but streamed for a few hours this evening to get some upgrade action done. I had two planned but only got one done that kicked my bum bum. Ah well, pickup where I left off tomorrow. I can't believe July is over tomorrow. 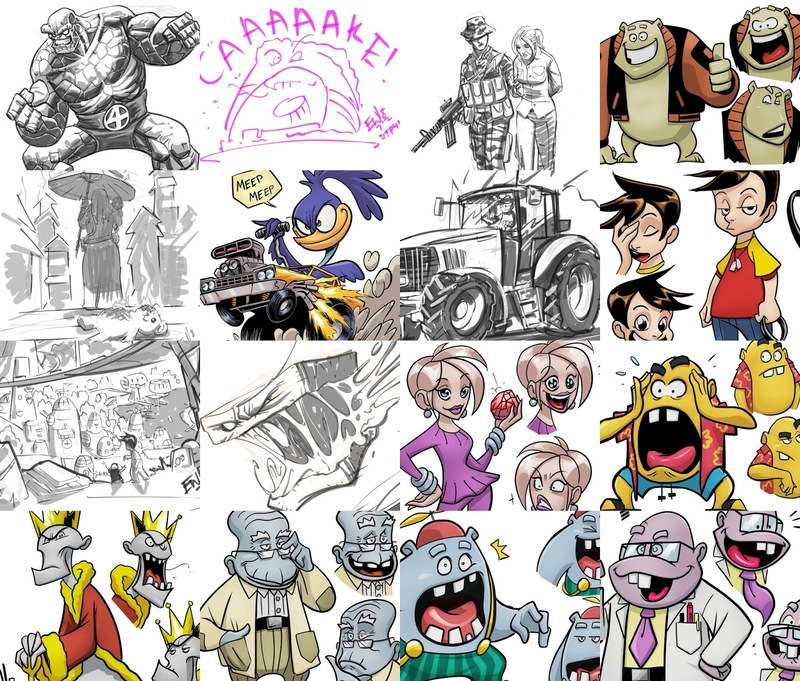 I'm going to have a special 'end of July special' tomorrow related to it being Tuesday and something to do with cartoons. 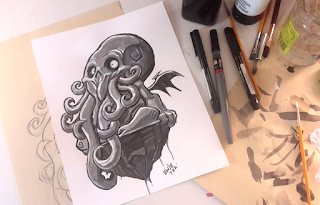 See you guys tomorrow 10amET for Drawing Request Show action! Big thanks to everyone who came out to the impromptu 'cover' stream today. I was excited for finishing the interior pages late last night and decided to take some time and work on the cover today. I also thought it would be fun to stream it. First I had a couple options in mind for the cover art. I like to do what I did with Volume One, use an image from inside the book to finish in inks and colors for the cover. The chat helped me narrow it down to a final one. I had to go with this one which was originally an Eryck Webb Original Content for Leokage. I adjusted it slightly to work better for the cover and got it finished inked up. The image above was me testing it out on the cover and mocking up some colors. The title and cover type is not final. Nor are the colors. But you can now get an idea of which way the cover colors are going. Thanks to everyone who came out and I cant believe this beastie is almost done!!! See you guys this week M-F for 10am-1pm EasternTime Drawing Request Show and Upgrades post DRS streams 3-5pm EasternTime . Only on Twitch! As of this post, the book is 100% built, written and draft 2 is finished. 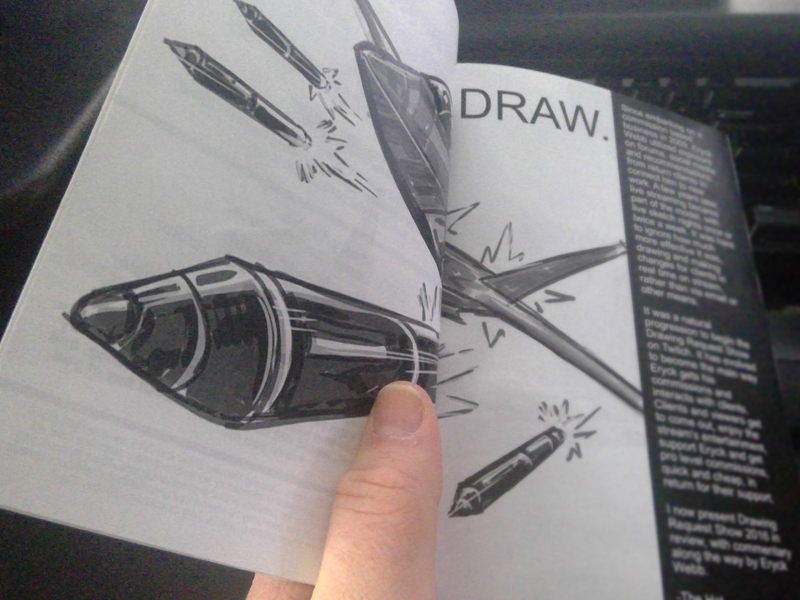 While draft one was the whole book build and design with all the images and content put in. Draft 2 is the version with all the copy and commentary added in as well. All 240+ pages of it. 250 pages of interior content total. So its off to the proof reading and perfecting for me and Kiwii and then off to the printers. Excited to launch this book and the presale very very soon!!! This one has been a monster compared to volume one. 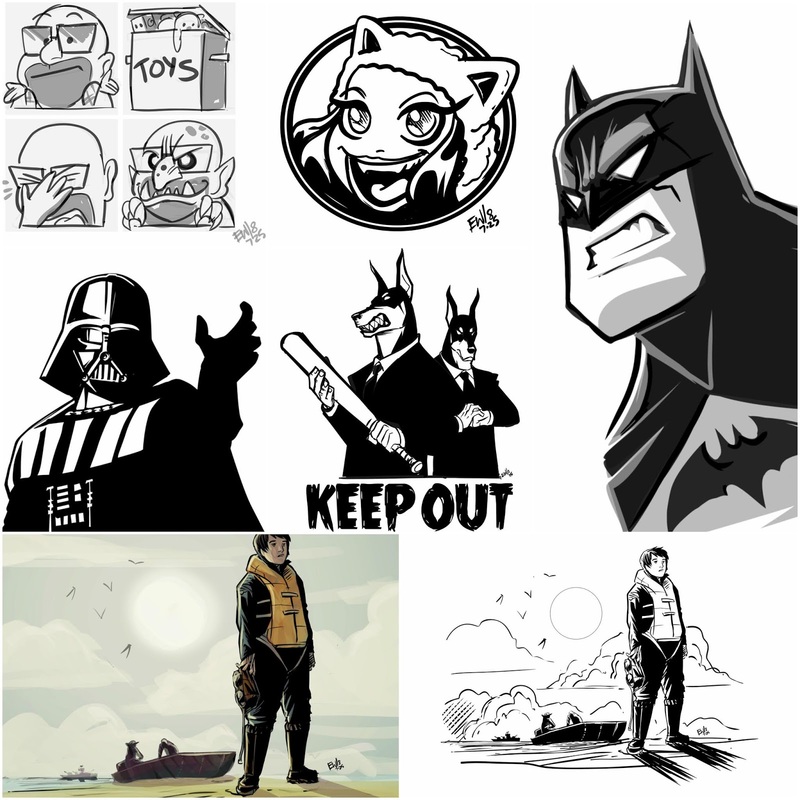 But offers a lot of beefier content and twice as many drawings as well. All in all I can confidently say it is several level-ups from the first one. But will look great sitting on a shelf next to the first one, and cost basicly the same. Its coming! Thanks to all who have encouraged me and shown interest in it and I have been working hard on it for the past several months and its ALMOST DONE. Stay tuned! Heres a couple spoiler free pages to wet the ol' appetite! As of this post, all art sent! We went back to basics today with Throwdown Thursday!!!! 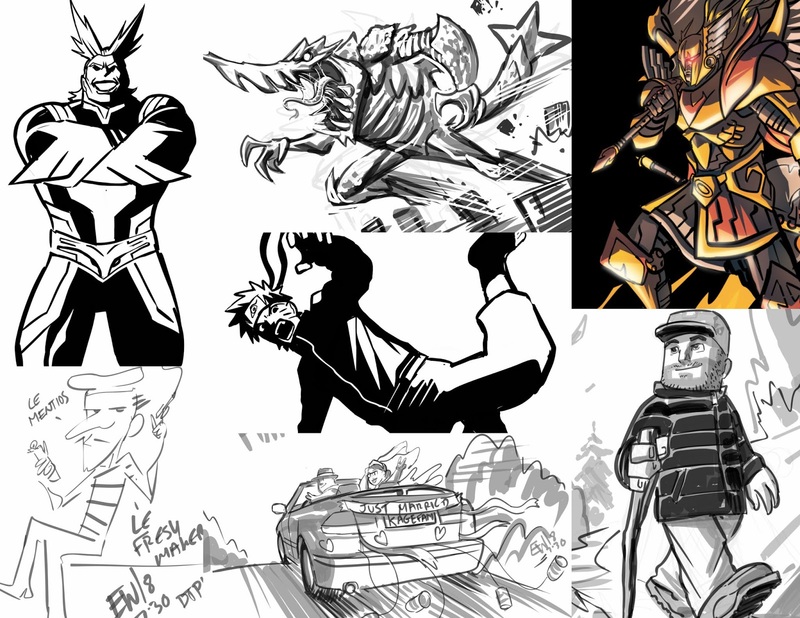 Streamed Drawing Request Show 10am-1 or 2 pm Eastern Time - then after a break and some lunch i came back and streamed a couple hours of 'Bonus Content' to cap off DRS episode 621! The bonus content was basicaly a production stream where folks could watch me working on upgrade inks and colors - the other end of the drawing requests - and I got 3 upgrade pieces done! Also for fun and cool down I did a final raffle for a 5 minute request piece and ExcideSC came in and sniped it so i drew a fun piece for him. All in all, feel like the sauce flowed well, and the groove is back. Sometimes, you just don't need to mess with what works. This afternoon saw support from two folks who will get gratitude spins tomorrow to possibly enhance their stream/ request experience... or at the very least thank them in an entertaining way. I believe we also unlocked a drawing request giveaway for tomorrow as well so thats gonna happen. 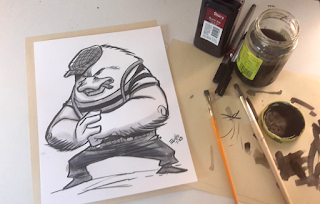 See you guys back 10amET for more Drawing Request Show and likely more upgrade action tomorrow afternoon! 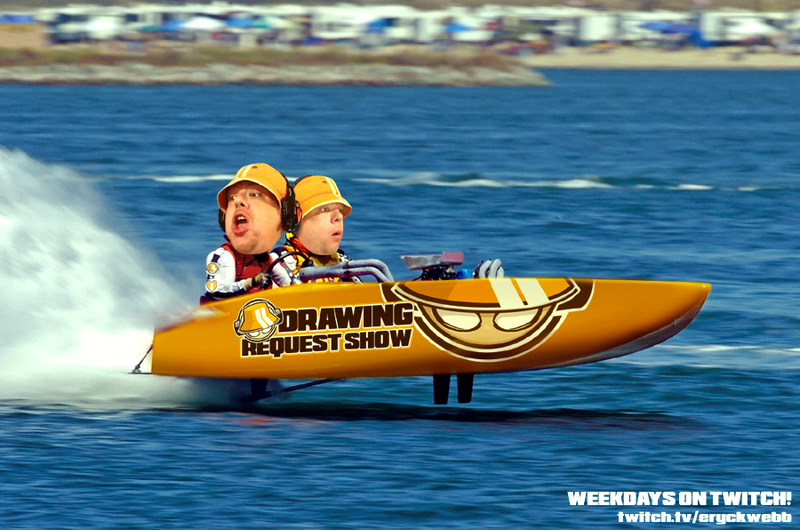 Drawing Request Show episode 621 is going LIVE at 10am Eastern Time ( 30 minutes )!!! 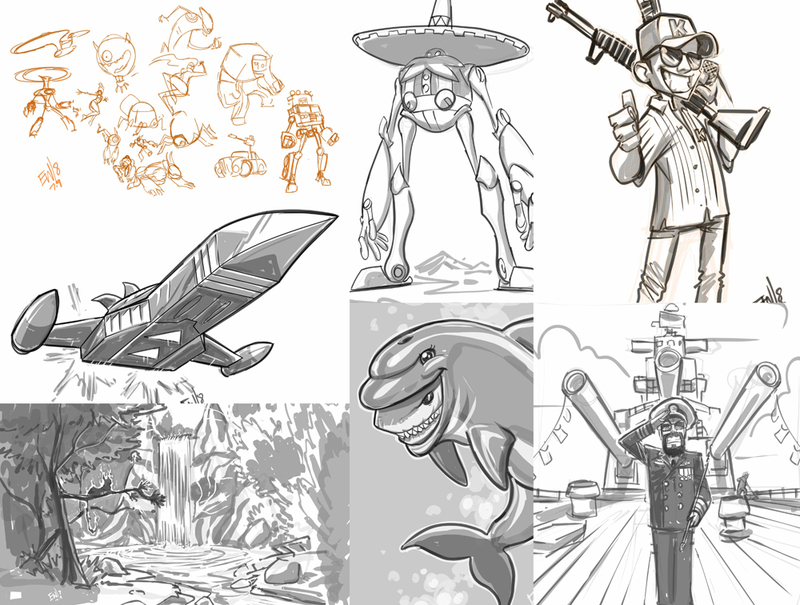 The integration of upgrades and drawing requests test is gone and the drawings are back 100% - lets DRAW some requests!!! Todays stream is 10am-1pmEST round abouts. Tentatively Eryck might even be streaming some upgrade production this afternoon. Lets DRAW!!!! "Little Lu loved to sit on his favorite zen stone and get lost watching the ponds of fate... as one does when they're out of school for summer..."
Own this original 8.5x11 cardstock Eryck Webb artwork! Only one like it, illustrated with ink via brush pen, sumi ink for the tones and shading and white acrylic for final details. Created with Ink and acrylic. Shipped in rigged secure cardboard envelope. Purchase securely via Credit Card or Paypal payment. Will have opportunity to review order at checkout. "Mick worked long hours down at the docks. Fortunately, there was always some new schmuck trying to ride his tail feathers. They always provided an opportunity to blow off some stream..."
Own this original 8.5x11 cardstock Eryck Webb artwork! 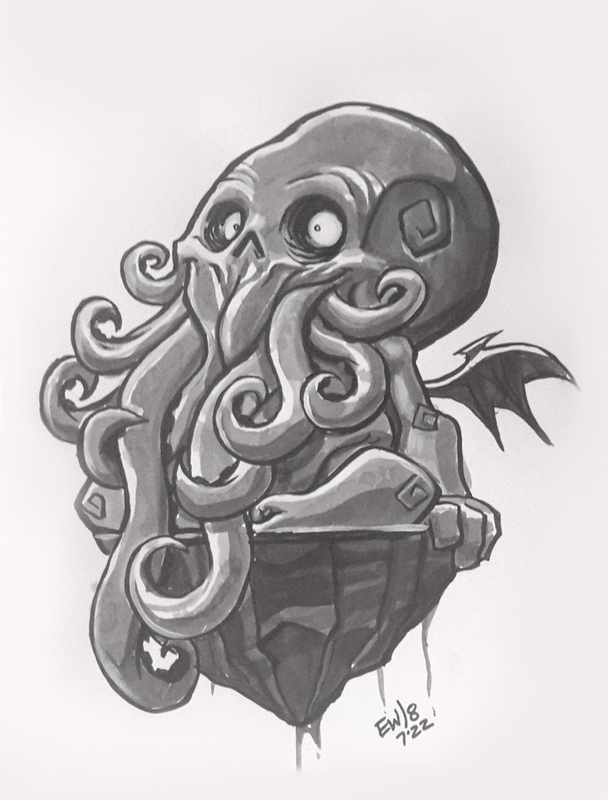 Only one like it, illustrated with ink via brush pen, sumi ink for the tones and shading. A quick daily discipline to keep up the muscle memory/ practice during my weekend off between streams. 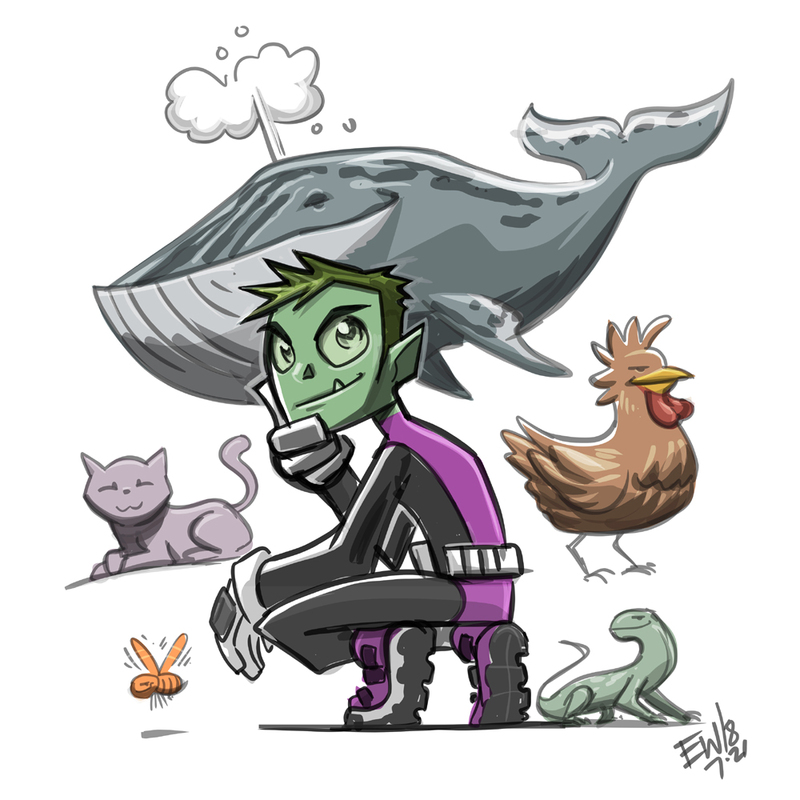 Felt like drawing Beast Boy! I started off just doodling him randomly in Inkscape without reference. Then when I did the final pass I looked up reference and made changes to his costume along the way so it looks like him more. But just kinda made up the composition as i went. Fun stuff. All drawn and colored in Inkscape. I gotta say. Saw the Titans trailer. Not impressed. Its all too dark. Hate the way they look and they are completely missing their child-to- adult spanning market by having Robin/ Nightwing cussing. I think its already a miss. Kinda like Iron Fist season 2 is supposed to fix all the problems with the Netflix version for the character so far. But nope, still not impressed after seeing the new teaser material. My favorite Teen Titans will always be this version, the Teen Titans and TT Go animations that I've been enjoying for the last decade or so. As for DC movies, the live action ones like Justice League, BvS and Man of Steel, as well as the Christopher Nolan Batmans and the coming 'Titans' just all miss the mark for me. Marvel continues to be capturing what we love about comics and super heroes on the big screen, and DC's best material is their animated features and shows. Love their animation. Justice League/ Unlimited, Batman series and TeenTitans/ Go - Young Justice etc etc. For DC, the animation is where I enjoy their characters the most. Marvel? I think they continue to fail as they always have with animation. They try again and again and except for the occasional well done Spiderman, they suffer from working with bad animations studios and/ or low animation budgets. But they continue to rock the cinemas, especially under Disney's ownership and their comics are top notch. I can take or leave the Netflix series but I enjoy them for what they are. Alright that's my rant. Trying to get the book done this weekend. Wanted to take time to keep the drawing practice up a bit. Back to work on Best of Request Volume 2 !! We had some priority requests I wanted to push and stream longer to get done, but right as I geared up to do it the internet at our house went out, then it came back, and as I tried to make sure we were live and good to go again, nobody in chat could see/ hear me and nothing seemed to be connecting right on my Streamlabs OBS. I think the program messed up from the disconnect or something. But I called it there, and we'll pick up where we left off on Monday! Have a fantastic night and weekend and see the crEW out Monday baby!!! Same Drawing Time same Drawing Channel!!! 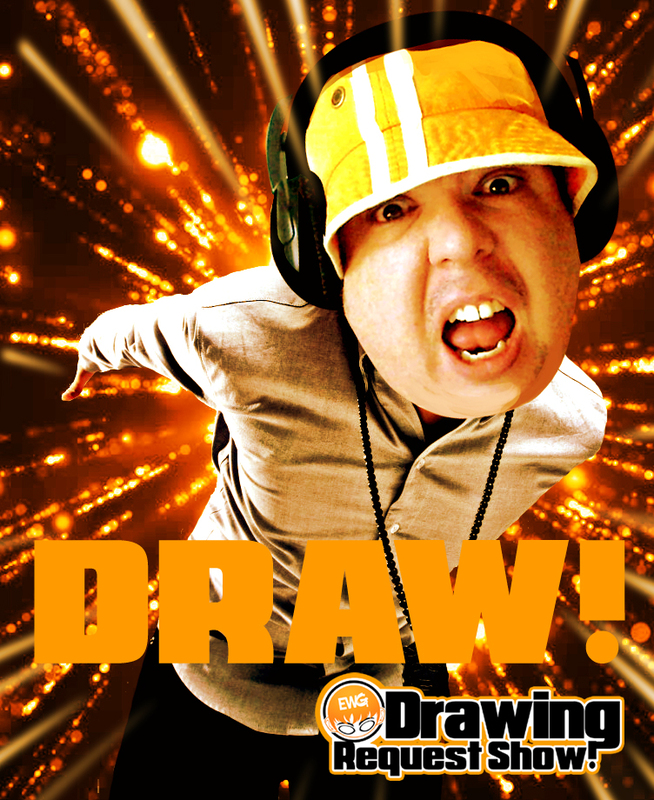 Drawing Request Show is going LIVE with Fired Up Friday! Lets DRAW!!! 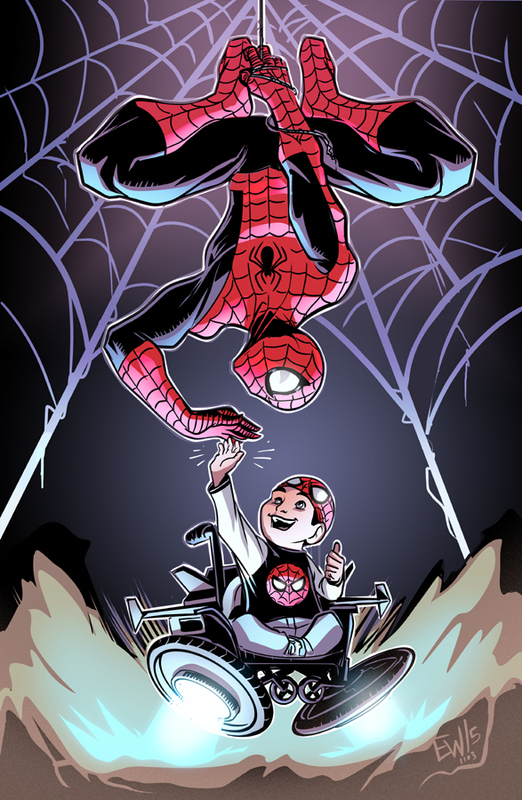 Art by SuppaRider! http://www.twitch.tv/supparider ! 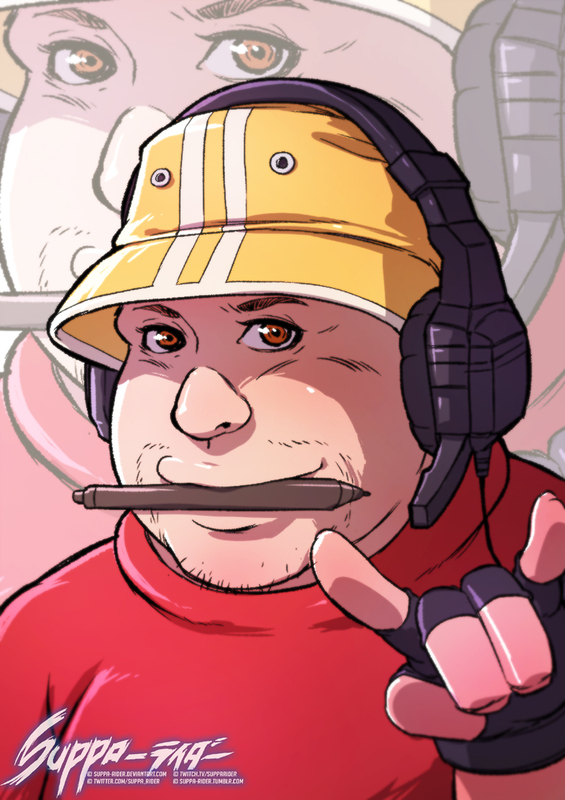 Hes doing $10 commission on his stream today! Go show him all the love, hes fantastic. But dont forget to come out and request a drawing or grind that gratitude wheel on Drawing Request Show!!! TGIF! Going live now! ( early birds only baby ) LETS DRAW!!!!!! As of this post, all art sent! Check your whispers! Thank you very much for all the support today! I lost count of the gratitude spins, and the raids and the bits cheered. It was amazing. You guys keep the sauce flowing and the draws slinging! Thank you! 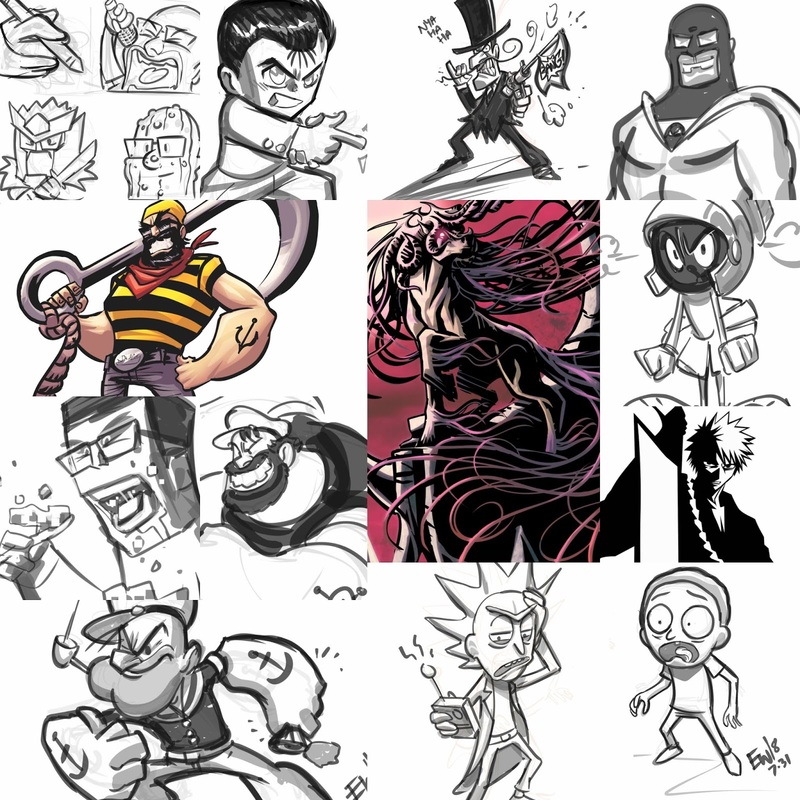 Among that some how I as able to do 5 drawing requests and even a few Drawings That Were Perfect 4 U and a warm-up drawing. All in all not a bad day at all! See you folks tomorrow 10amET for more drawing!!! I did have a mistake where while working on part 3 of a 3 part request for MinecraftArchitect90 I accidentally crashed inkscape and then went and did some giveaways and gratitude spins before i went and reopened inkscapes backup file and it got over ridden by a Drawing Thats Perfect 4 U ( oops ) that I did during the giveaways and gratitude spins but I took a screenshot from the stream today and will rock it out soon as Minecraft comes out tomorrow. On the house. I'm giving you your drawing time back on the list so you can have a drawing of anything you want after man. Thanks for being so awesome and patient!!! See you tomorrow same drawing time same drawing channel! 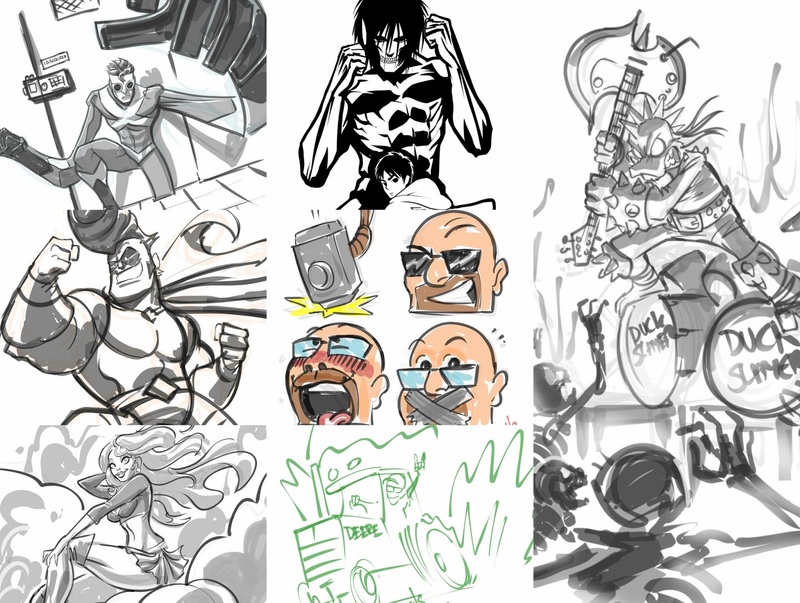 Drawing Request Show is LIVE for Full Throttle Thursday!!! 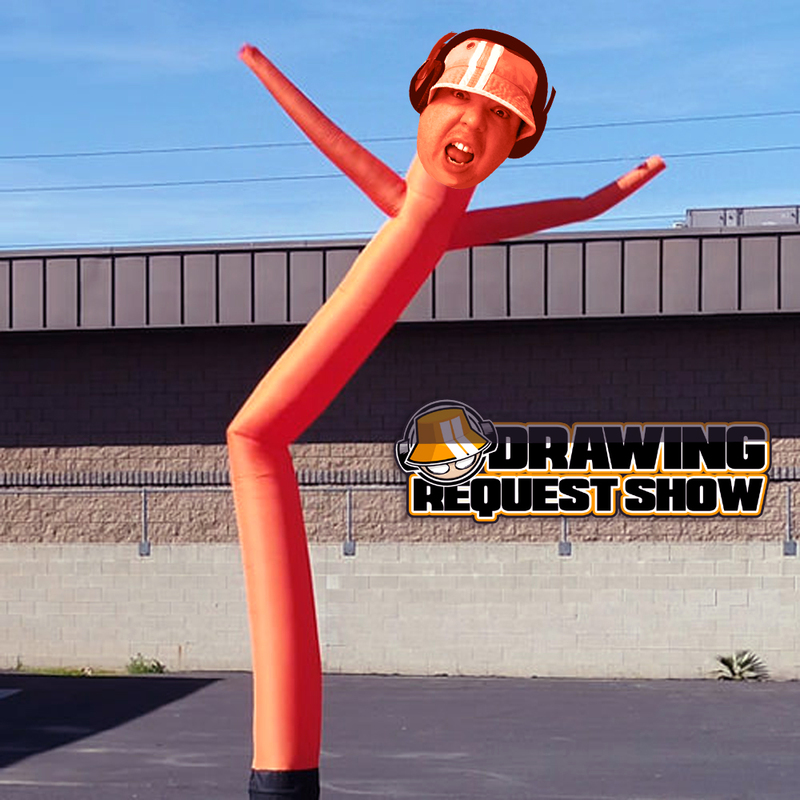 EW is live with a Full Throttle Thursday edition of Drawing Request Show!!! Going live NOW!!! 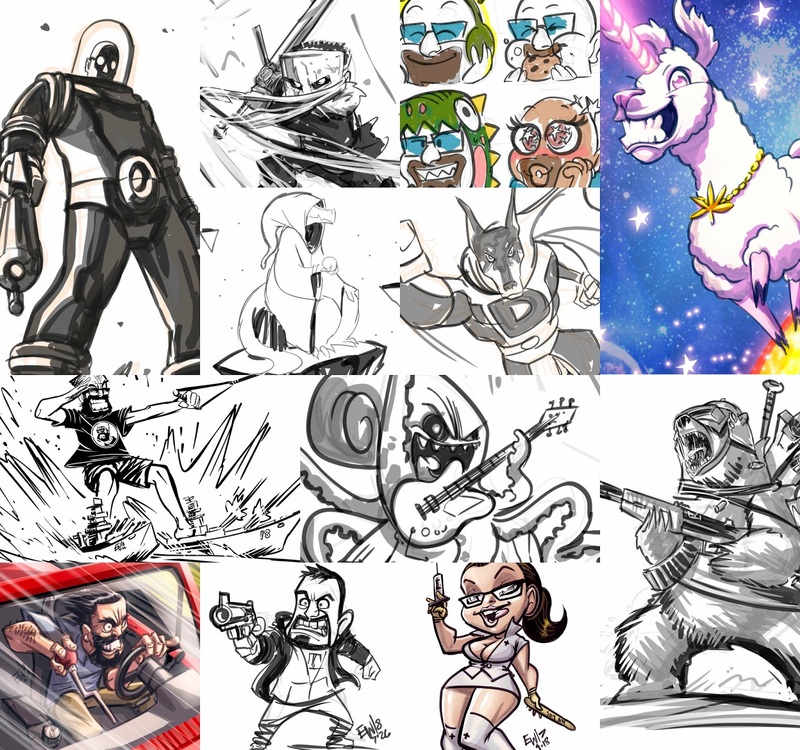 ( 10amET ) Forget about the moshpit that is SDCC and come get your art drawn live and fast for you instead!!!! In the convenience of your own chick den or man cave - lets DRAW!!!!! Thanks for all the support! All these drawings have been sent! Check your whispers! Today we hit 1500 followers! Thanks to all the new faces I've enjoyed meeting this year so far! Big ups to all the follows, tips, cheers and hosts today!!! Back tomorrow with more! See you at the next Drawing Request Show live on Twitch! EW is going LIVE on Twitch one more time this week! Lets have ourselves one fine FRIDAY!!! 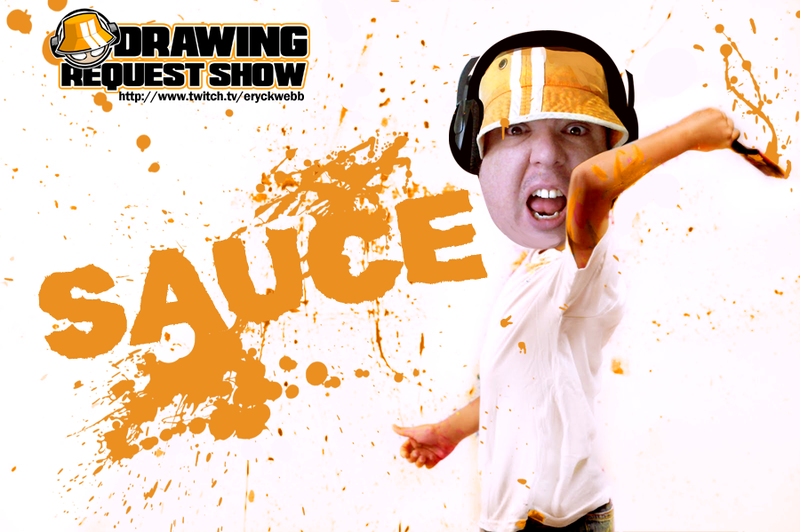 Drawing Request Show - Throwin Sauce Thursday! Is GOING LIVE! EW is live 10am Eastern Time on Twitch! Its Throwin Sauce Thursday! 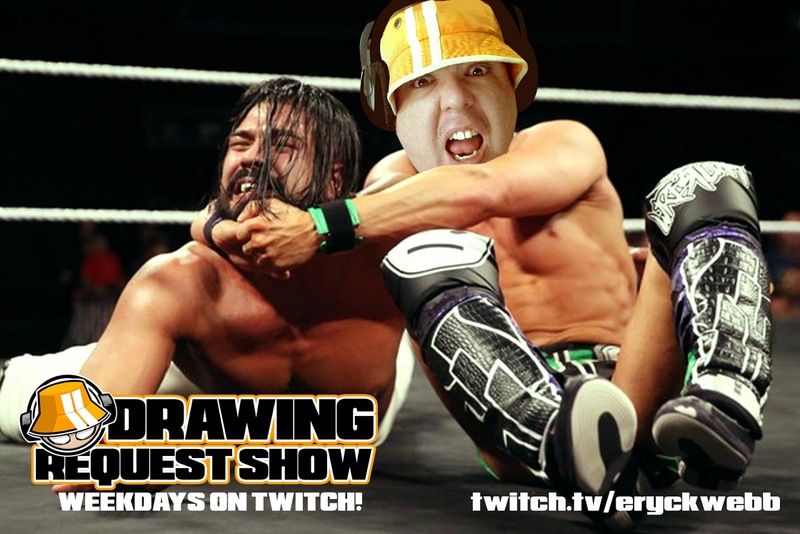 Come out, watch Eryck sling some digital drawing sauce and draw viewer requests!! 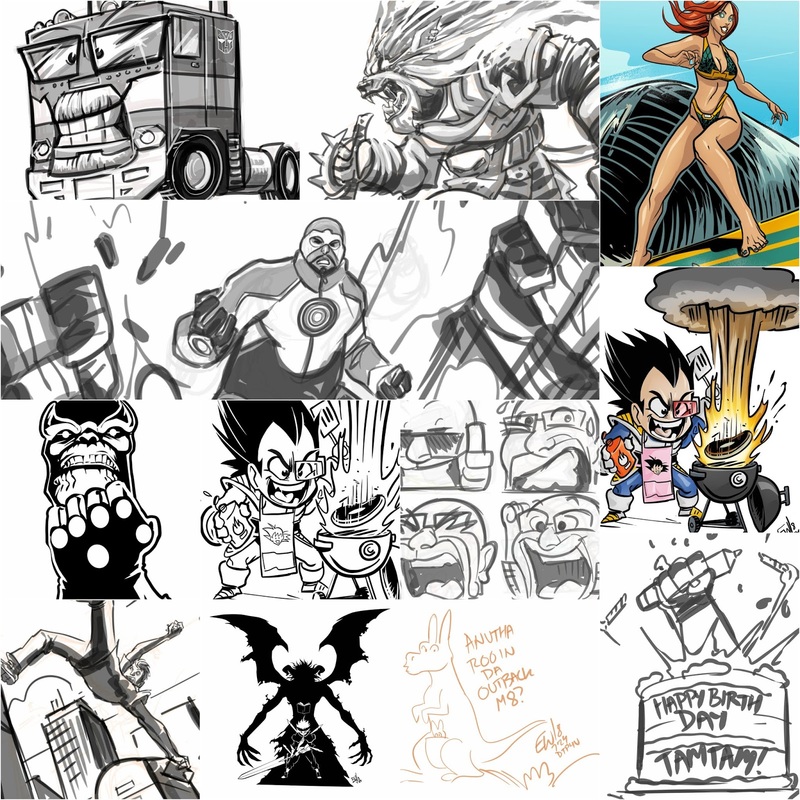 Theres sure to be exciting drawing action, epic giveaways, other unexpected entertaining shenanigans! Better audio, Faster Drawings, Higher Quality Sauce and more Orange than ever! Thanks to everyone who came out and enjoyed the stream. Much to my dismay, the horrible microphone audio that has been plaguing the stream was only slightly improved. It was miles better than the audio yesterday ( during Tuesdays stream ) but still not good enough for what I want as a professional and as a full time streamer. So I worked this afternoon to remedy the situation with getting the wiring reworked and rearranged so that i can use my headset. I'm happy to report the mic is now 'studio quality' and sounding fantastic. No room echo, no background noise and no cracking even when I get loud. Now i got nice audio to go with the nice video quality. Come tomorrow 10amET ill be matching the nice audio and video with some nice vector crisp drawings with extra sauce as well. Looking forward to it. See you all 10amET for more Drawing Request Show!!! 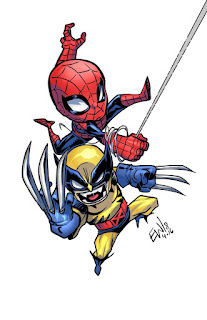 EW is going LIVE 10amET with Drawing Request Show!!! Come out get some drawing action. Have fun, be entertained. Whats not to like? Let EW get yEW over the hump! As of this post, all art sent! Check those whispers! It was Two-Fer Tuesday! Today started with the intent to draw for folks who came out and offer two requests before cool down or two items from retainer added today instead of one. This happened but an unexpecte surprise did as well. Long-time Request King Trayde threw down some massive love and support to the stream and unlocked 6 giveaways for the chat. We also crushed the gratitude record of 16 gratitude wheel spins per stream with a total of 21 spins. Thank you so much guys for a fun day of unexpectedness. We went over an extra 2 hours to make up for all the giveaway goodies and not getting any drawing done. Earlier this morning I also got inking done on one of a few rush orders I have to do this week. Its currently being colored. The whole stream was fun, and there was some great highlight moments I would have liked to have made clips of for the EW YouTube channel but the entire stream suffered from crappy microphone audio. I cant believe it was bad from the moment I started to the moment the stream ended. Ugh *palm to face*. I took some time this afternoon to troubleshoot and test it till it sounded right. The clip above was a fun highlight from today of a new Gratitude Wheel item. Sorry the mic is bad. But overall pretty happy with the scene. \Yes currently the mic I use is the one on the camera and yes it will always sound a bit like im in a room but it shouldnt be low volume and cracking everytime i speak. So I got it figured out pretty good and based on what i changed to make it sound better it seems like the gain on the compressor filter i was using was out of hand. I got it squared away and hopefuly itll be on point tomorrow. See you guys at the next Drawing Request Show, enjoying some summer morning hours. Who knows if it works out enough it may be come the regular time. Its nice to be done by lunch time with my whole work day ( even though I start early in the morning before DRS even starts) and have rest of the day to do yard work, stuff around the house, go out enjoy the day with kristina or even work on improving the stream or other personal projects like my book ( s) and or personal art projects and practice. The flexibility has been nice so far. I completely understand if the timeslot doesnt work for some folks anymore and they just arent able to come out anymore. I gotta do what is better balance for my life not what might work better for a person or two. Unfortunately! Im very much a morning person brain power wise. 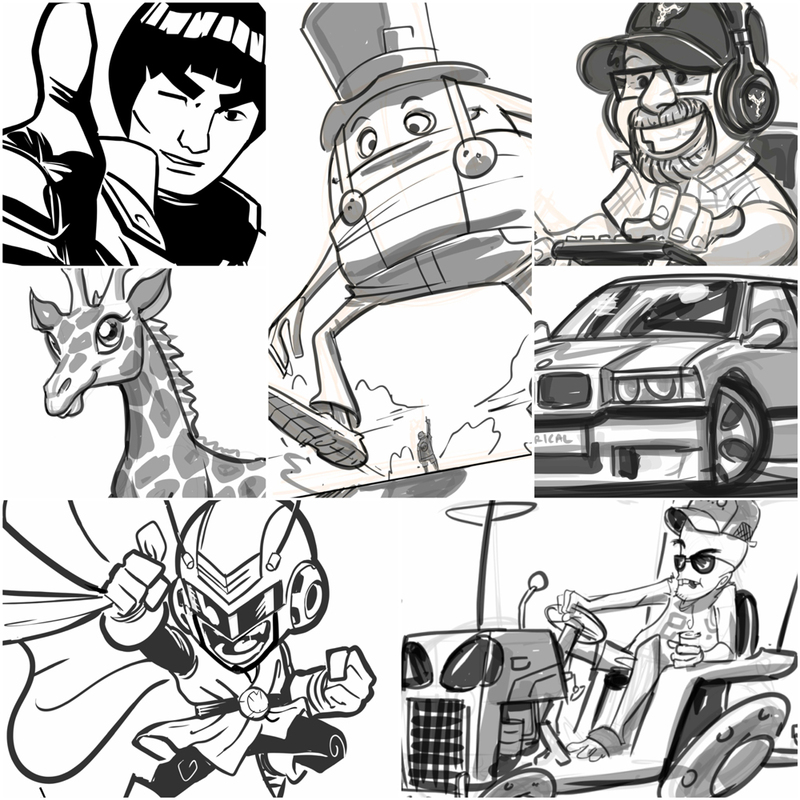 See the CRew and YOU out 10am Eastern Time tomorrow morning for more drawing action!! As of this post, all art sent! Check your whispers! 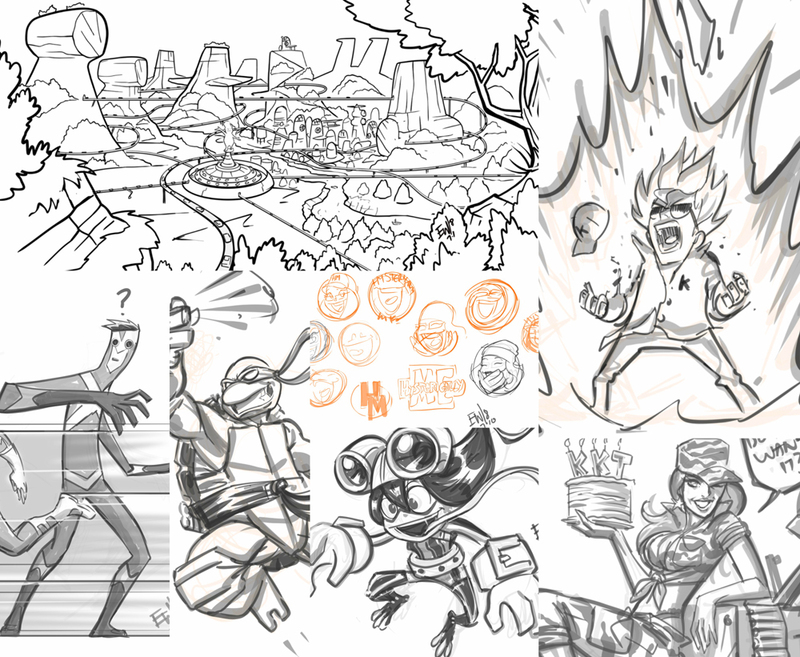 Had a fun Monday back at the Drawing Request Show action. I had been keeping up the practice over the weekend drawing in my sketchbook. Didn't have much rust when I sat down to get drawing. Started with 15 minutes of drawing warm-up for myself while I waited for folks to wake up and come in with their coffee. Then we rocked several fun requests who folks who were here and skipped a whole lot of items that got put in the bank. Warmed up with random sketches off the top of my head. Resulted in a lot of cool robots and creatures. Even an enterprise mech? Why not. Nows a good time to come out get a drawing request if you want something done quickly cause there is a short list right now and no priority tokens on the list. We got 5 requests done this morning as well as a 6th request for your truly who was given one by somebody a month or so ago. Its a slow time of year as people are hitting conventions, traveling and out for the summer but its a great time for those who can make it to come out and get a drawing with very little wait. 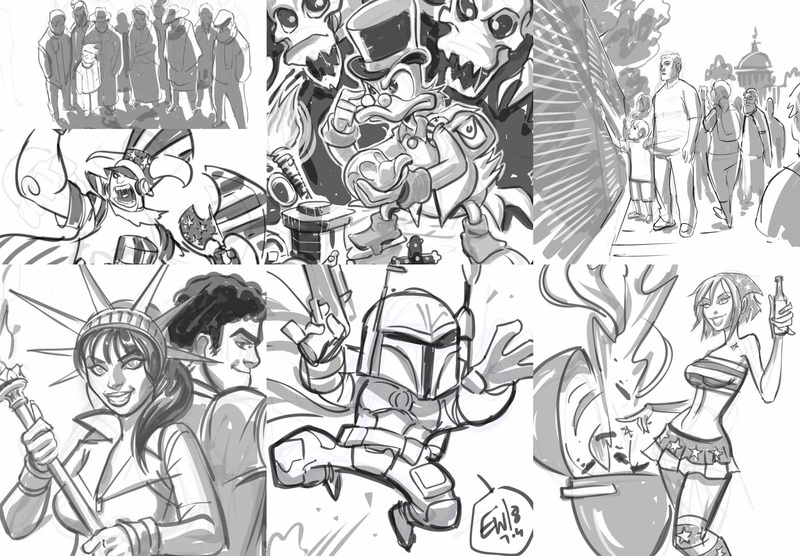 Back tomorrow 10amET for more Drawing Request Show - trying out some summer hours trial run this week. Doing 10am-1pm all week. Working on upgrades in afternoons/ evenings offline. See you tomorrow on twitch for Drawing Request Show!! 10amET - 1pmET !!! There are still a few copies left of the limited print run of Best of Request Volume 1 available. 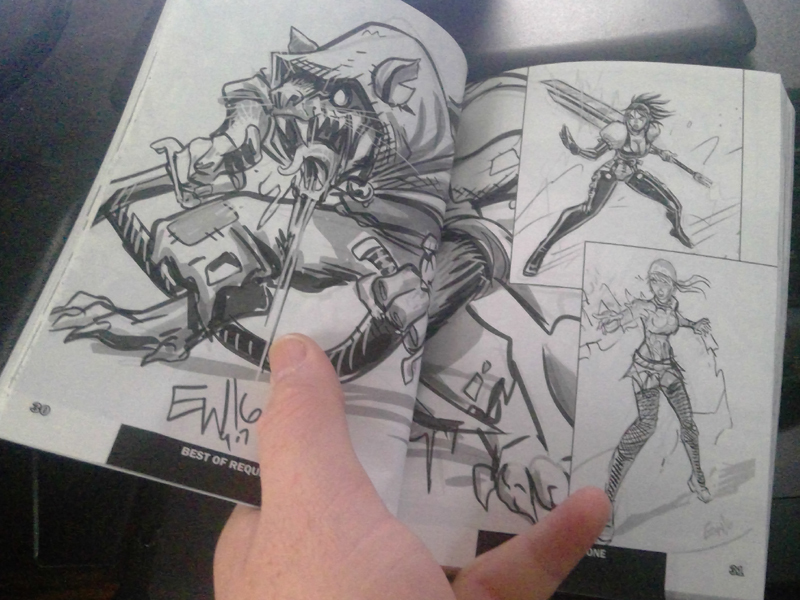 200 pages of EW drawings and other stream content including EW's commentary on the stream and the drawings all through the book! Get it in the EW shop! 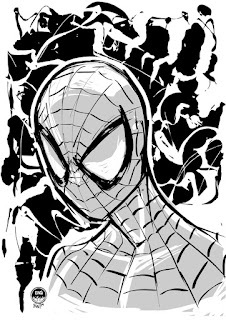 Rest in peace Steve Ditko! 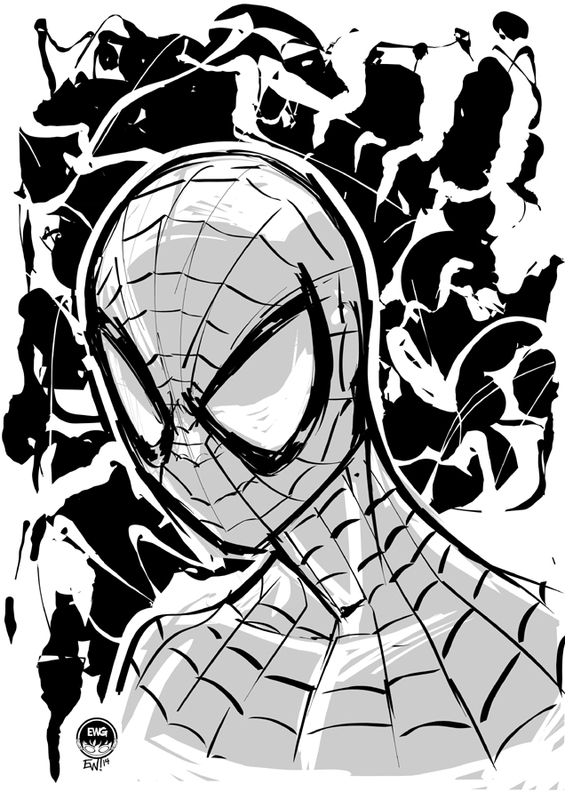 Your name will always be synonymous with Spiderman, Marvel Comics ... and countless other creations! The modern face of super hero entertainment would not be possible without your contributions. I have always been and will be a huge Spiderman fan. 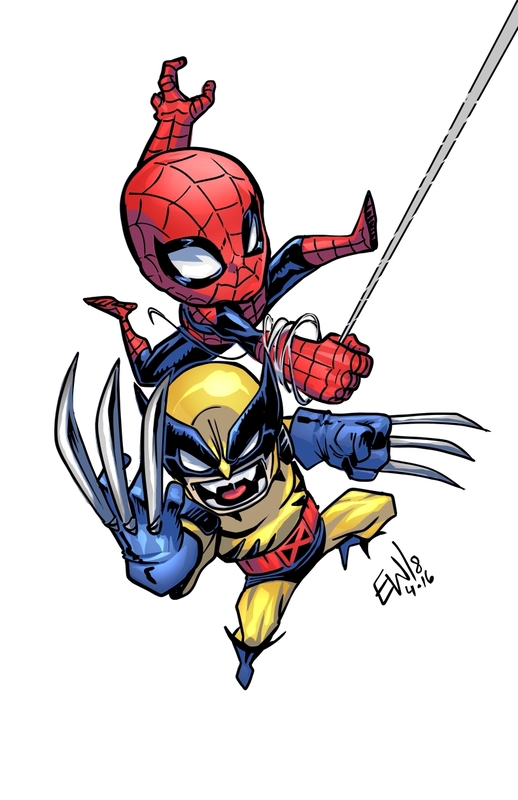 Perhaps my number one favorite marvel character. Its a character I often have trouble drawing because my fandom gets in the way. 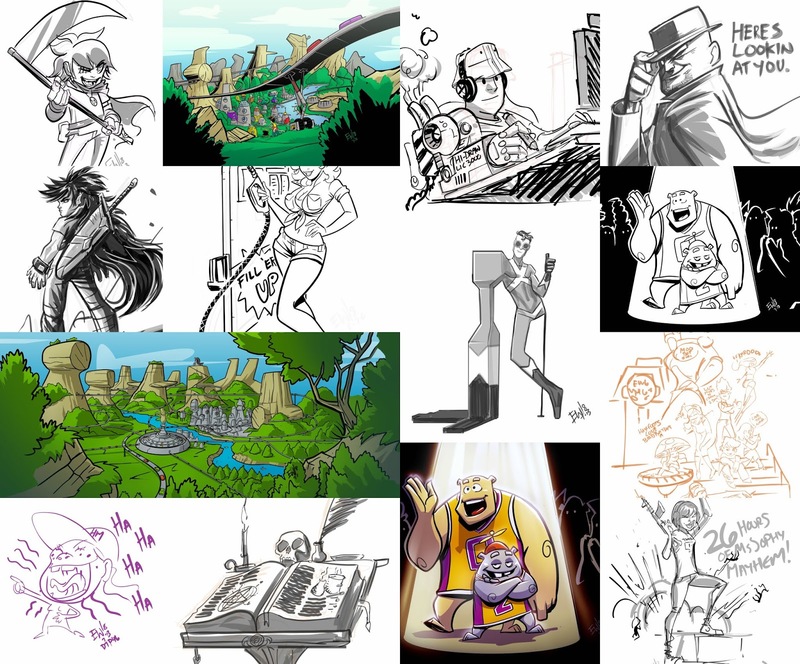 Hes been done so well by so many artists over the years that I often wonder how I stack up. But few did it better than Steve Ditko. Safe travels to the great studio in the sky! 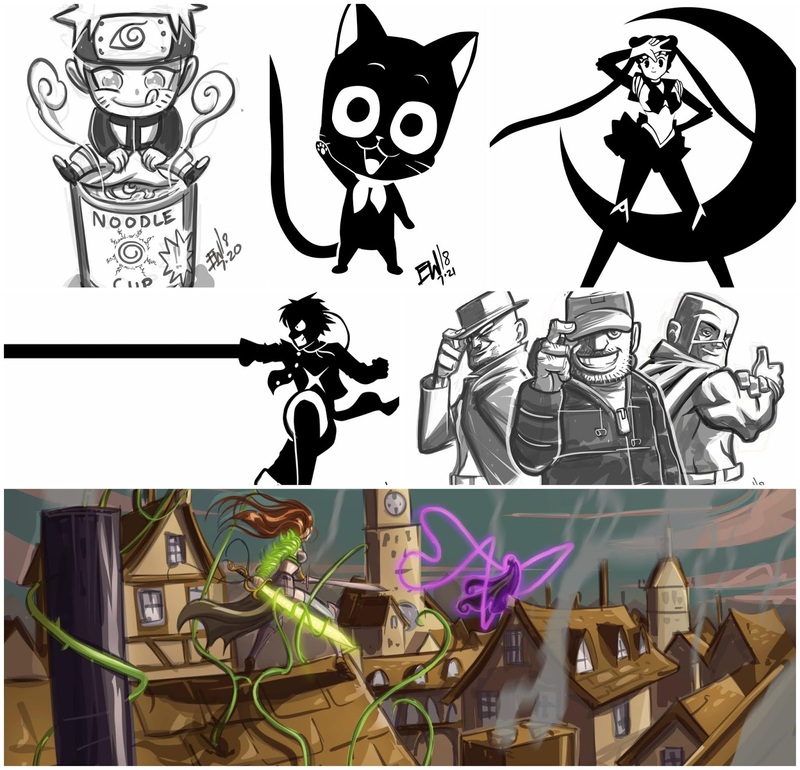 As of this post, all art sent! Masterlist updated! Check those whispers! Thanks to the trEW crEW who came out early this morning for a morning edition of Drawing Request Show! It was around 930am and I was itchin to do some Drawing Request Show. Tempted by the idea of having the afternoon mostly off I loaded up fresh coffee, chiseled away the sleepy crust and got to drawing! We did Gratitude time every hour with new gratitude items, including winning extra sauce, new chroma thank yous and some classic ones added back for supporting me. Even spent an hour with no hat on cause somebody got to change my head gear. Them DLC stream contents tho. 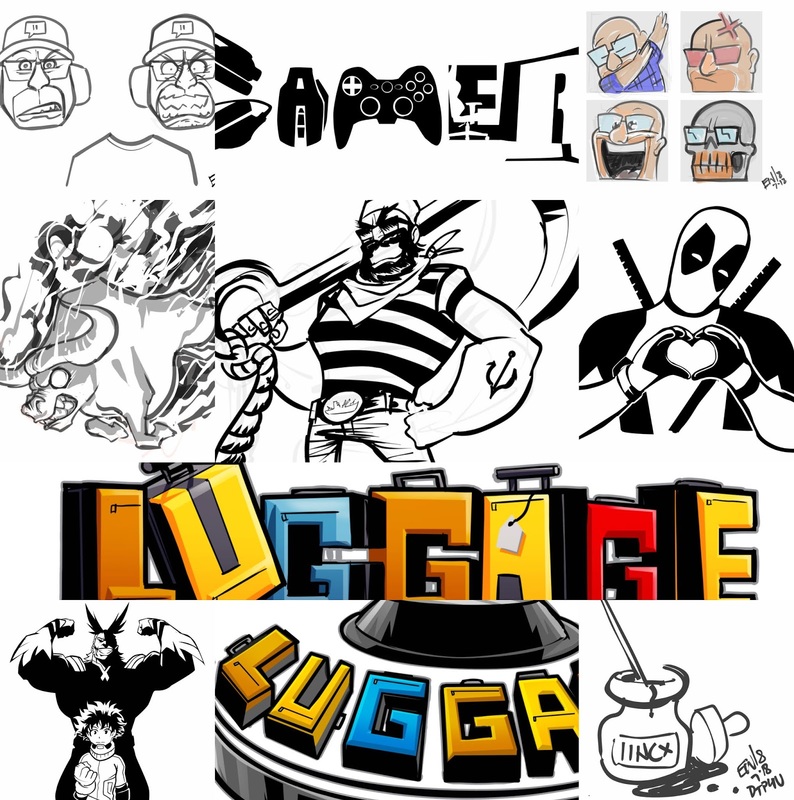 Thanks for all the fun requests, check the instagram and deviantart links on this site ( top right of each page) to checkout latest additions to both image galleries. EW is officially invoking summer hours starting next week! 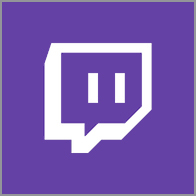 We're going be doing 3-4 hour stream every weekday morning 10am Eastern Time to 1pm Eastern Time. Mark your calenders! Monday, Wednesday and Friday will be Drawing Request Show per normal. Tuesday and Thursday will be DRS Upgrade Editions! I'll be working on inks and colors all day on those days. See you monday on twitch for Drawing Request Show!! 10amEasternTime!!! 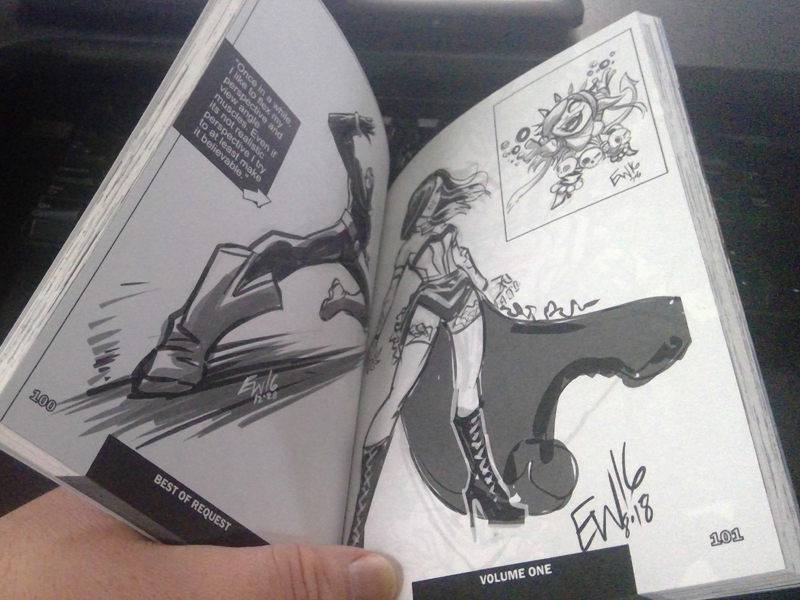 There are still a few copies left of the limited print run of Best of Request Volume 1. Thanks for everyones patience as I ended up spending time with family and such instead of getting these sent out thursday. 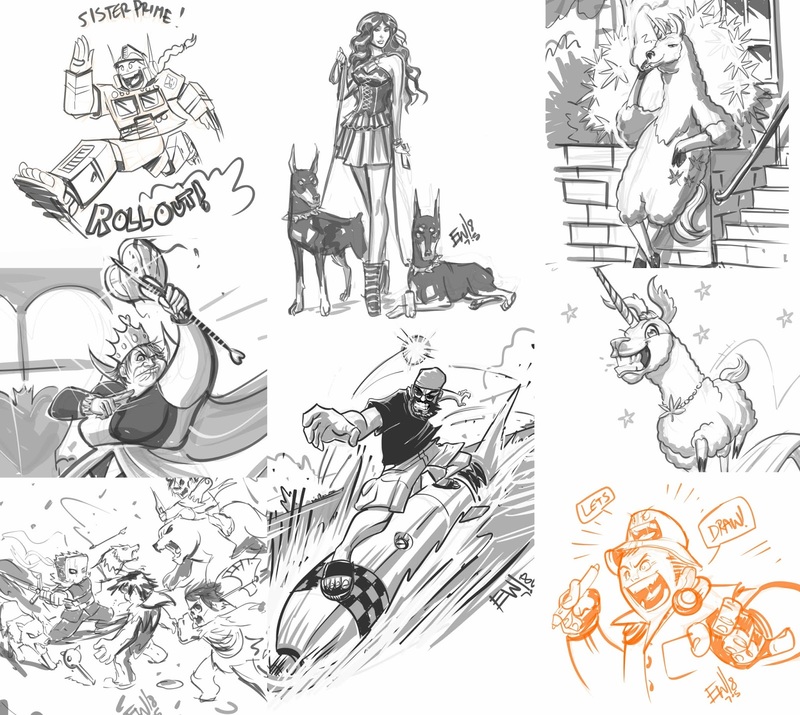 I had a lot of fun post-4th of july drawing for folks. I was in process of revamping the gratitude/ giveaway wheels so I tried out non-wheel versions of gratitude and giveaways today. 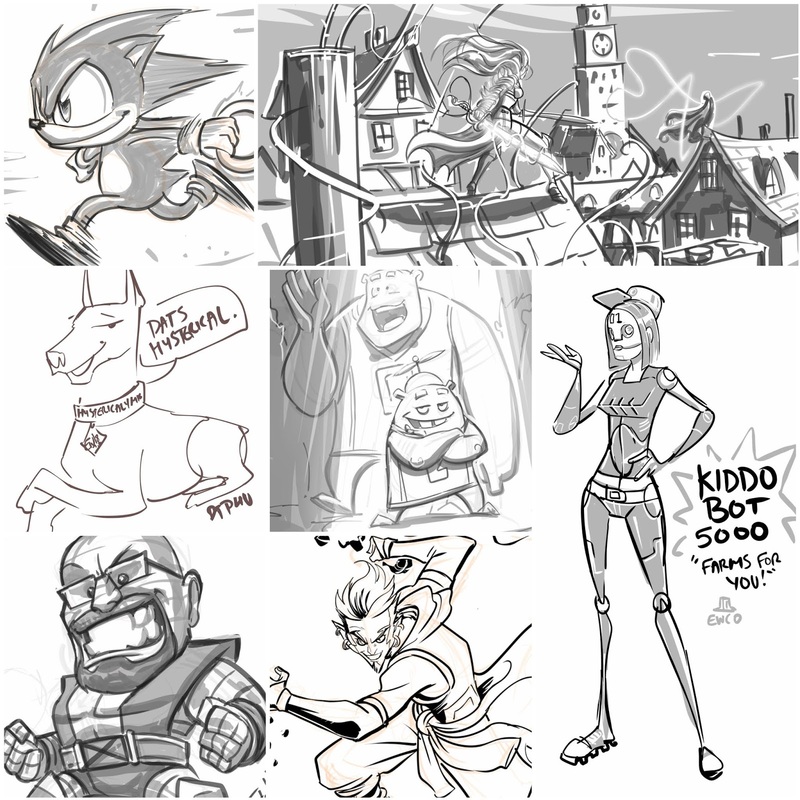 Have several favorite drawings from this day. A good thrashin-sauce thursday for sure! See you on twitch for Drawing Request Show!! As of this post, all art sent and masterlist updated! Thanks to all who have been coming out this week while most folks are on vacation for 4th of july week and in general for summer. 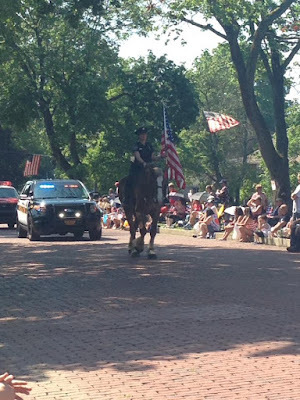 I took the morning off for some 4th of july parade goodness here where we live. This town dont fool around for the 4th! 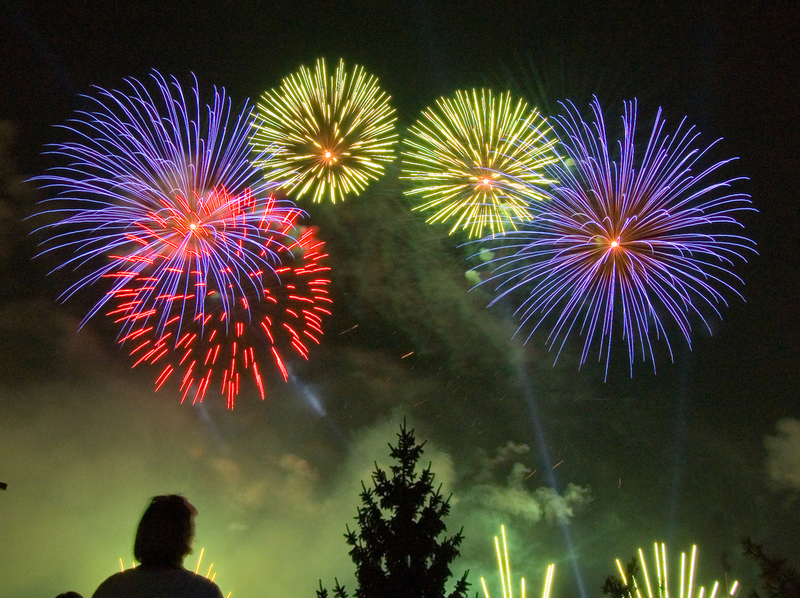 They always do a 2-3 day celebration culminating in some epic fireworks july 4th night. Kristina and I got way overheated and sunburnt from the parade but really enjoyed it. The afternoon was spent cooling down getting some lunch, and streaming 4th of July style with the twitch population! Big ups to Adufresne99 for the amazing raid. Thank you for all the love. Picked one of her community via raffle to get a drawing request and they seemed to really enjoy that. Sent the love over to MoojiGaming when I was done. 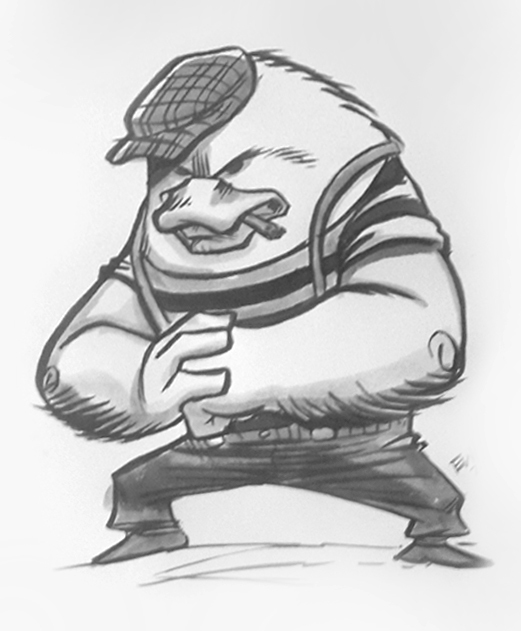 The 'Scrooge McDuck' piece was the first ever 666min Drawing Request ( aka untimed drawing). It is an item that can only be won. It gives 15minutes of yay or nay from the requester, and then after that I have free reign to finish it up with no time limit. Overall this item takes around 30 min plus or minus. There were other good sentimental pieces and 4th of july fueled pieces and shenannigans. Thanks for keeping me drawing! Kiwi and I watched a patriotic movie and had dinner in the cool AC and then after the sun went down ( with no effect on the nasty humidity mind you ) we joined our friends in our front yard to watch the fireworks go off at the park! Was super fun and I enjoyed the more low key holiday. We always try to host a barbque and grill and have everyone over and this was a nice change of pace. Honestly it would have been miserable to have everyone over. We would have had to just party inside most of the day or something. It was NOT nice out lol. Maybe next year it'll be better. But now that the 4th is over... time to get back to the draws once again this afternoon! See you 2pmET M-F on twitch for Drawing Request Show!! As of this post, all art sent and masterlist updated! Thanks to all who have been coming out this week while most folks are on vacation for 4th of july week and in general for summer. We skipped a ton of people, and got down to the folks who came out in a hurry. Lots of fun on all of these. Some creative surprises along the way. All in all fun stuff overall. Thanks for keeping me drawing! 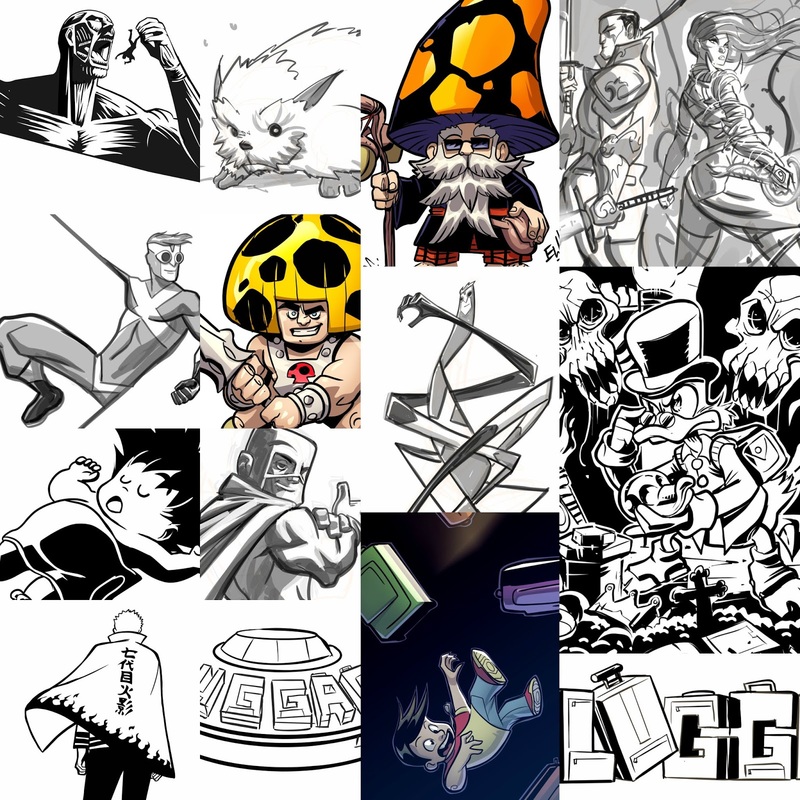 As of this post, all art sent and master-list updated! Thanks to all who hung out Monday afternoon for Drawing Request Show. That morning had been plagued with technical difficulties ranging from my wacom driver to my mouse, my webcam and everything in between. 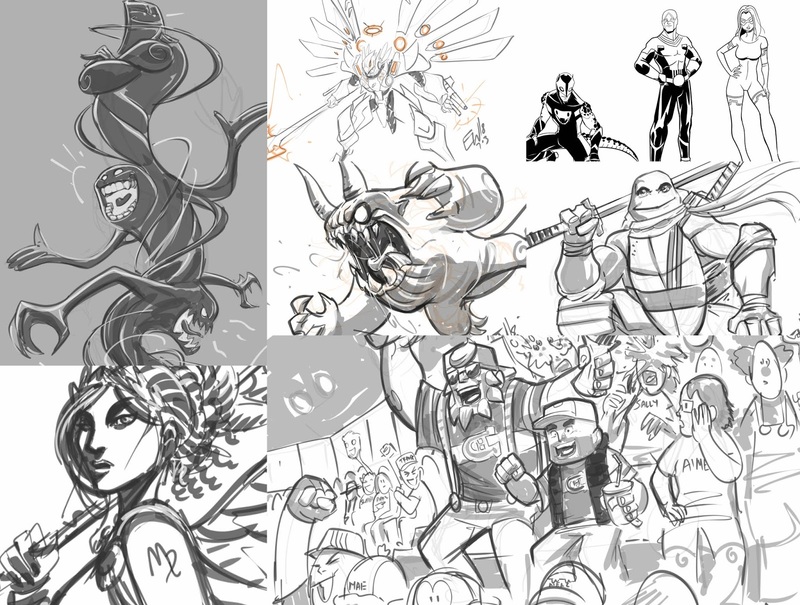 But I somehow managed to pull it together by 2pmET for some Drawing Request action. It was fairly quiet as was expected. 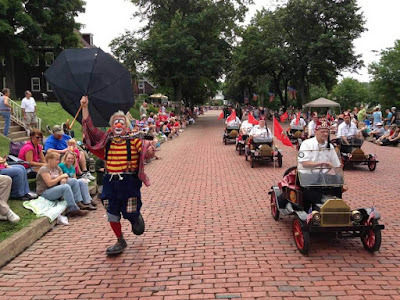 This is the week for vacations, 4th of july celebrations and other summer thingies. So maybe this will be a good time of year to work on that backlog and whittle away at the list of regular donated requests. Anythings possible. I made up for not getting any upgrades done Monday morning by pulling a late night Monday night. Jumping back and forth between sitting and when I got sleepy going into stand up mode, I got to work on some rush orders for request clients. Strategically Kristina has been flatting these rush orders since I got them. And I was able to fly through them all Monday night and knock them out. So in total I finished 7 one week rush orders and one 3 week order a day before it was technically due. Though I have no doubt both folks would be very kind and patient with it being a bit passed the promised due date, its my intent to get it done AHEAD of that date. Always. Somebody is supportive enough to throw big ticket priority tokens on their orders, I will do my best to knock them out every time. Thank you to Merc Raider and Trayde for your support! 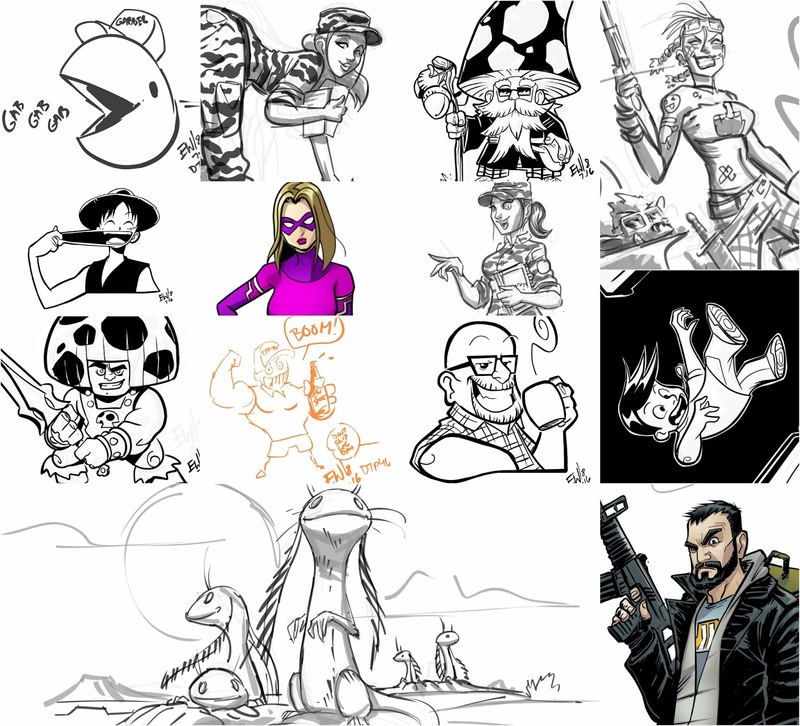 And to everyone who made it out for today's Drawing Request Show and put down for some request action. 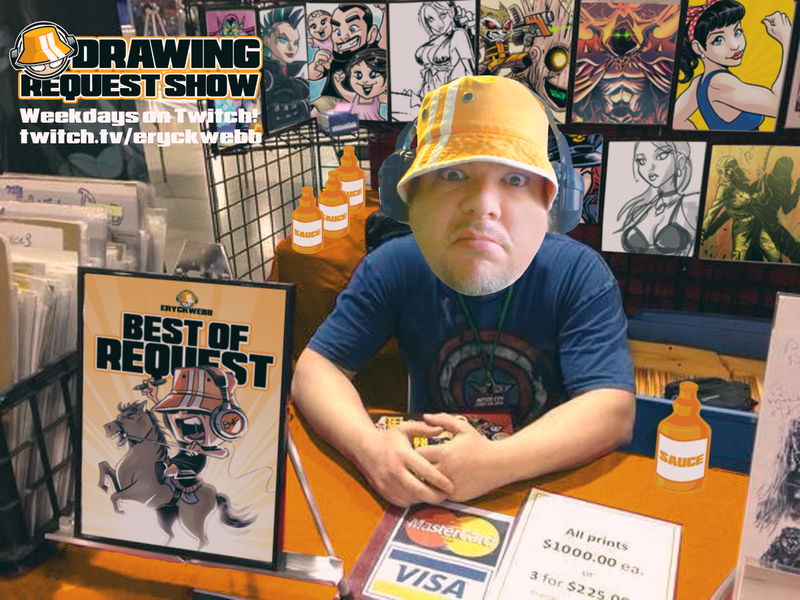 Ill see the crew back out 2pmET this afternoon for another Drawing Request Show!